One of the most popular models for a flat Earth presumes the Earth to be a circular disc centred at the North Pole, and with Antarctica spanning the rim and providing some form of impassable barrier to simply travelling off the disc. 1. People heading south always end up at this same spot, no matter which line of longitude they head south along. 2. At this place, the sun circles the horizon once per 24 hour period during the southern hemisphere summer, not setting until the autumn equinox, after which it circles below the horizon throughout the southern winter, only rising again at the spring equinox. This is exactly as expected for a physical South Pole on a spherical planet. 3. The place is directly underneath the point in the sky around which the southern stars appear to revolve, in a manner exactly analogous to the movement of the stars at the North Pole, but in the opposite rotational direction. The stars at the North Pole appear to rotate clockwise in the sky, while at the South Pole they rotate anticlockwise in the sky. 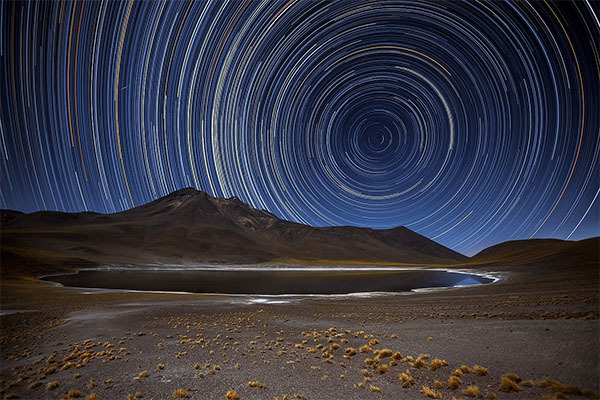 Star trails in the southern hemisphere, photographed in the Atacama Desert in Chile. (Creative Commons Attribution 4.0 International image by the European Southern Observatory.) This photo shows the motion of the southern hemisphere stars through several hours of a night, moving in apparent circles around the South Celestial Pole (the point directly above the Earth’s South Pole). I tried to find a copyright or royalty-free photo of star trails photographed from the South Pole itself, but could not find any, however Astronomy Picture of the Day has such a photo taken at the South Pole, showing complete circles over a 24-hour period of darkness. Furthermore, from this place, or areas around it, there are no directions in which one cannot travel. There is no visible edge of the disc, nor any impassable barrier to travel. The same argument applies to the North Pole if the flat Earth is supposed to be a disc with the South Pole at its centre. 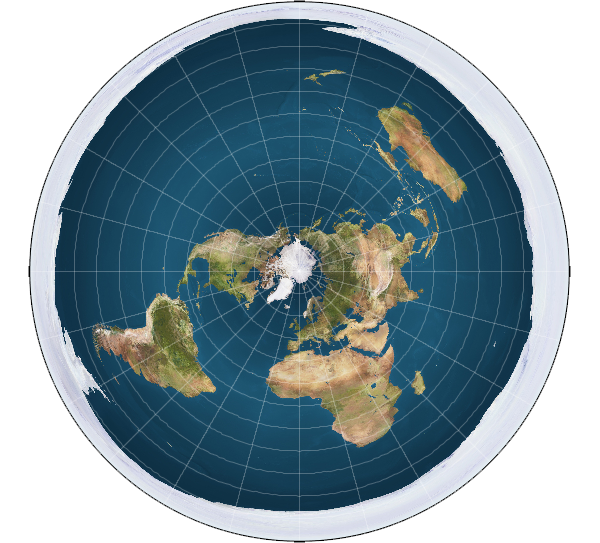 And if the disc is some other configuration, then there will always be some point on the spherical Earth that ends up corresponding to all the points around the rim of the flat disc Earth – where it is straightforward to travel to that point on the spherical Earth but which is unreachable or should display bizarre properties (such as a rim or impassable barrier) on the flat Earth. All of this is difficult to explain in a flat Earth model, but is a natural consequence of a spherical Earth. Well, it’s easy to explain with a Flat Earth model if you just assume that anyone who has been to the south pole is ‘part of the conspiracy’ and has lied. At least, that’s been the argument of Flat Earther’s I’ve had discussions with. I think a bigger problem with the above flat map of the Earth, is the distance between points. At both 45° N and 45° S, the distance between 0° E and 60° E/W should be the same on a spherical Earth. On a Flat Earth, the distance will be much greater in the southern hemisphere. Arguing that everybody who has taken a plane flight in the southern hemisphere has lied about how long it took because they are ‘part of the conspiracy’ should be harder than claiming a handful of people who have been to the south pole have lied. That “bigger problem” will come up in later posts. As an added bonus, time lapses taken of the night sky anywhere reasonably near the Equator will clearly show the presence of both celestial poles at the same time. Any interest in a contest to guess the eventual excuse? Well, I guess the flat-Earthers shouldn’t find it too hard to hit the antarctic coast at a point where there are 50m cliffs of ice that they can claim as confirmation of their prejudices, provided they do it before global warming progresses significantly further. Of course, this may involve being very selective about which parts of the continent they visit, but being selective about what evidence one accepts is part and parcel of every conspiracy theory. I’ve heard of one claim that the Sun circulates parallel to the plane of the Earth (on a trajectory that varies during the course of the year, naturally, to account for the seasons) and that light curves upwards (which means the speed of light is lower at high altitudes, or else magic) so that the sun appears to pass below the horizon when it’s actually passed far enough away that its rays headed in your direction graze the ground and head back up again before they reach you. The optics of this are a little tricky, as fairly simple reasons persuade me to expect the exact reverse direction of curving, except where (as in a mirage) very hot air lies under significantly cooler air (a state of affairs that convection tends to make transient). Still, if some magical means could account for light curving upwards, it’d shoe-horn at least some observations into their model. However, if our flat-earther boat-load (or anyone else who volunteers for the other half of this experiment) goes far enough south (e.g. into the Ross or Weddel seas) in late December (which is when it’s probably safest to sail in those waters), they’ll see the Sun – twelve hours after it passes north of them going east to west in the usual way – to the south of them, headed west-to-east; they’ll then be able to ‘phone folk (at the opposite longitude, but north of the equator, as long as they’re south of Bodø) and confirm with them that they see the Sun, also to their south, but travelling east to west. (From the Weddel sea, call Japan or Taiwan; from the Ross sea, call southern Europe.) If the southern ice is the outer perimeter of the disc, that’s rather tricky to explain away. The sun’s trajectory can’t pass further south than the tropic of Capricorn, after all (since that’s the furthest south that folk ever see it over-head): so how can it ever appear to be in the south when seen from the antarctic coastal seas ?